It was my day off today so I knew I wouldn’t have too much trouble finding a dog! I went to visit my parents and we all wet for a little walk. 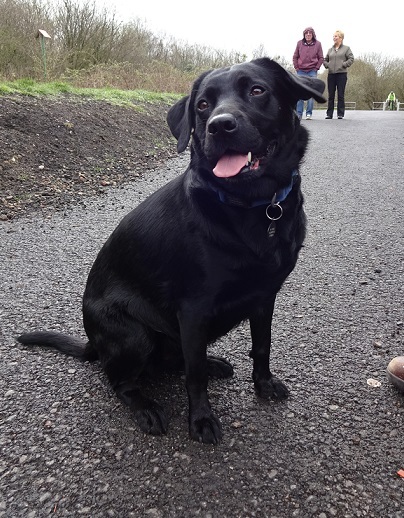 We then spotted a very beautiful and friendly Black Labrador called Mia. I think that Mia is one of the friendliest dogs I’ve ever met! She came up to all of us to say hello with a big smile on her face; she’s a gorgeous dog! Mia is best friends with a French Bulldog called Rudy. They hang out with each other most nights and they both sulk if they don’t see each other, how cute! Mia is also friends with the lovely Bentley from day 99! Favourite food: Anything! Mia is currently on a diet though which she’s not happy about!